Between low-carb or high-protein, vegan and vegetarian, gluten-free and more, it seems specialized diets are becoming more and more common. One such diet that’s increasing in popularity lately is actually one of the oldest: the Mediterranean diet. Unlike many diets, which focus on what foods people aren’t eating or shouldn’t eat, the Mediterranean diet emphasizes what foods should be eaten—plant-based foods, healthy fats, herbs and spices, fish and poultry. The reasons for the Mediterranean diet’s rise in popularity has much to do with its support of not just healthful eating, but eco-friendly sourcing practices for food as well. The Parma, Italy-based think tank, Barilla Center for Food & Nutrition, developed the “Double Pyramid” concept, which emphasizes how foods like vegetables and fruits, legumes and grains have a lesser effect on the environment than, for instance, red meat and dairy products. As such, the Mediterranean diet emphasizes consumption of foods that are not only better for eating, but better for the environment as well. Beyond simple menu items, Mediterranean diet principles are becoming more common in healthcare, thanks in part to the emphasis on eating whole foods without demonizing more indulgent options. Massachusetts General Hospital’s “Choose Well, Eat Well” program places a green label on the healthiest items available, a yellow label on less-healthy items, and a red label indulgent items. Additionally, healthier items are kept more visible than the more indulgent foods, and there’s been a shift to offer a bigger variety of healthy items as well. 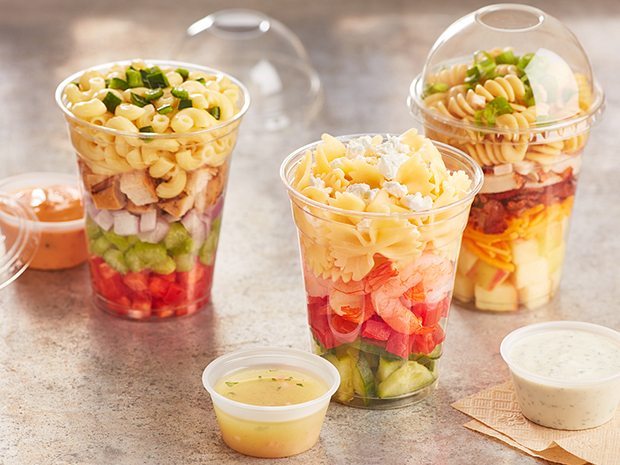 “We try to have all of our healthy options at eye level to make them more available and more prominent,” says Deborah Boudrow, senior procurement manager at Massachusetts General Hospital, which serves Barilla Whole Grain and Multigrain pastas as regular offerings. Boudrow says that a lot of the hospital’s heavy salads have been replaced with more whole grain options as a way to offer healthier options. “We’re trying to add more grains and…make people aware of them,” she says. As consumers become more familiar with the diet and its concepts, they’re more likely to incorporate dishes that align with the Mediterranean diet into their lives. To help move the Mediterranean diet forward, one company is offering a program that includes menu development and educational materials for facilities that want to get involved. Barilla’s Good for You, Good for the Planet (GYGP) programs offer assistance with executing a Mediterranean diet plan, plus blog content and social media content, menu display and more. Educating consumers about the benefits of the Mediterranean diet—both nutritionally and environmentally—will ideally increase participation, both in healthcare and beyond.